Thermo Scientific Pierce MM(PEG)12 is a methyl-terminated, polyethylene glycol compound (12 PEG units) activated with a maleimide group for covalent pegylation of sulfhydryls on proteins (e.g., cysteines) or assay surfaces. Why PEGylate a protein or peptide? 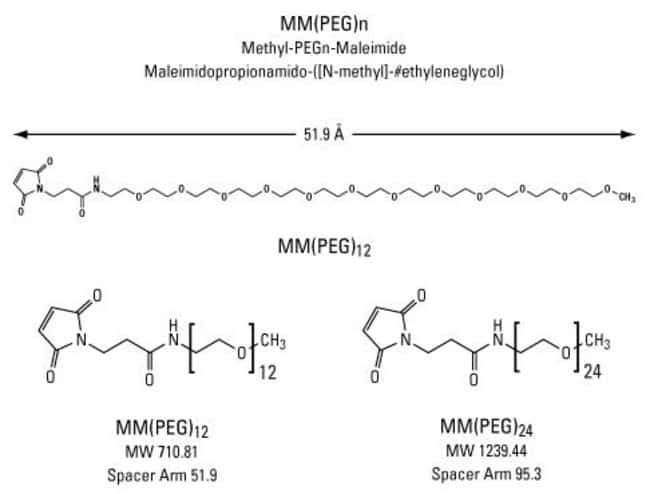 PEG-containing reagents have been used to modify proteins to provide specific advantages. Protein PEGylation can improve the stability of the modified protein, protect it from proteolytic digestion, increase its half life in biological applications, mask it from causing an immunogenic response, decrease its antigenicity or potential toxicity, improve its solubility, diminish the potential for aggregation, and minimize interference for both in vitro and in vivo applications. Polyethylene glycol, also called polyethylene oxide (PEO), has these effects because it is nontoxic, nonimmunogenic, hydrophilic, water soluble and highly flexible. These reagents are specially synthesized as homogeneous compounds of discrete chain length and defined molecular weight. As such, they enable precise control and optimization of surface protein modification experiments. By contrast, typical preparations of PEG compounds are heterogeneous mixtures composed of multiple chain lengths and a range of molecular weights. Upon receipt store desiccated at 4°C. Product is shipped at ambient temperature.